Water has been a part of my life from as early as I can remember growing up. In Michigan, my grandparents lived on a lake and they told me I wore shoes in the water because I didn't like the dirt on the bottom. When I moved to Colorado in 1993, I missed the water badly. It was natural to pursue a sport that required water. Life has a way of getting you where you need to be eventually. A long story short, I started kayaking, specifically, in 1997 when I was given a kayak for Christmas and told I was no longer allowed to be in the raft. I had learned to roll in 1995 so I was excited with this new toy and could hardly wait until spring. When the snow melted, I snuck into an unopened pool (with the help of the key) to practice my roll. The police showed up in response to the silent alarm. Oops. It took a year of boating with rafts and a class with a local kayak shop, but I found a group of Class IV+ boaters that let me tag along and made me learn the basic kayaking skills. Eventually, my buddies went off to boat harder water during spring runoff. I joined CW to find boaters of my similar skill level. 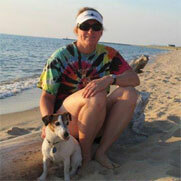 I became a certified ACA instructor in April 2011 to improve my own boating skills. It was a great experience and, as a bonus, I now instruct classes for CW and another non-profit. I enjoy introducing people to the river and encouraging them to embrace the experience and adventure at their own speed. My reward is a student's smile and excitement. My old kayaks retire to Lake Michigan, where my parents live. My nieces and nephews enjoy them on the lake when they visit. I still get to enjoy them on the waters I grew up in. Sometime soon, they'll be asking to learn to roll and coming along on river trips. 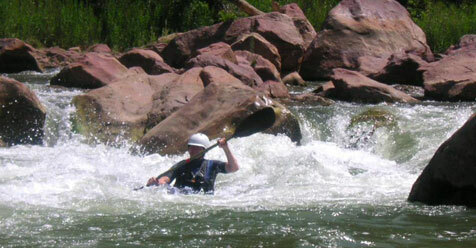 Leslie on Hell's Half Mile rapid on the Green River.